"Xankəndi" redirects here. For other uses, see Xankəndi (disambiguation). Location of Stepanakert in Artsakh. Stepanakert (Armenian: Ստեփանակերտ Step'anakert; Eastern Armenian pronunciation: [əstɛpʰanaˈkɛɾt]), Khankendi (Azerbaijani: Xankəndi) and originally called Vararakn (Armenian: Վարարակն), is the capital and the largest city of the de facto Republic of Artsakh. The Republic has no international recognition, being deemed part of the Republic of Azerbaijan by most countries. As of 2015, the population of Stepanakert is 55,200. Stepanakert meaning the city of Stepan is named after Armenian Bolshevik revolutionary Stepan Shaumian. The name is formed of the words Stepan (Armenian: Ստեփան) and kert (Armenian: կերտ) meaning town. According to medieval Armenian sources, the settlement was first mentioned as Vararakn (Վարարակն, meaning "rapid spring" in Armenian), a name that remained in use until 1847, when it was renamed Khankendi. Azerbaijani sources generally say that the settlement was founded in the late eighteenth century as a private residence for khans of the Karabakh Khanate, and was thus called Khankendi (Turkic for "the khan's village"). The settlement was initially called Khanin Kendi (Xanın kəndi), but then was shortened to Khankendi. After the Russian Empire gained the territory of the Karabakh Khanate through the Russo-Persian War of 1804–1813, the name Khankendi was charted on Russian maps. In 1923 Khankendi was renamed Stepanakert by the Soviet government to honor Stepan Shahumyan, ethnic Armenian leader of the 26 Baku Commissars, and, after the Shusha pogrom had resulted in major destruction at Shusha, the former regional capital, Stepanakert was made the capital of the Nagorno-Karabakh Autonomous Oblast (NKAO). In time, Stepanakert grew to become the region's most important city (a status it received in 1940). Its population rose from 10,459 in 1939 to 33,000 in 1978. In 1926, municipal authorities adopted a new city layout designed by the prominent Armenian architect Alexander Tamanian; two additional designs for expansion were approved later on in the 1930s and 1960s, both of which retained Tamanian's initial plan. Several schools and two polyclinics were established, and an Armenian drama theater was founded in 1932 and named after Maxim Gorky. Stepanakert served as Nagorno-Karabakh's main economic hub, and by the mid-1980s there were nineteen production facilities in the city. The political and economic reforms that General Secretary Mikhail Gorbachev had initiated in 1985 saw a marked decentralization of Soviet authority. Armenians, in both Armenia proper and Nagorno-Karabakh, viewed Gorbachev's reform program as an opportunity to unite the two together. On 20 February 1988, tens of thousands of Armenians gathered to demonstrate in Stepanakert's Lenin Square (now Renaissance Square) to demand that the region be joined to Armenia. On the same day, the Supreme Soviet of Nagorno-Karabakh voted to join the Armenian SSR, a move staunchly opposed by the Soviet Azerbaijani authorities. Relations between Stepankert's Armenians and Azerbaijanis, who supported the Azerbaijani government's position, deteriorated in the following years and as a result, nearly all of the Azerbaijanis fled the city. After Azerbaijan declared its independence from the Soviet Union in 1991, Stepanakert was renamed by the Azerbaijani government back to Khankendi as part of a campaign against communism and Azerification. Fighting broke out over control of Nagorno-Karabakh which eventually resulted in Armenian control of the region and a connecting corridor to Armenia to the west. Prior to the conflict, Stepanakert was the largest city of the NKAO, with a population of 70,000 out of a total 189,000 (Armenians at the time comprised 75% of the region's total population). By early 1992, that figure had dropped to 50,000. During the war, the city suffered immense damage from Azeri bombardment, especially in early 1992 when the Azerbaijanis used the town of Shushi as an artillery firebase to rain down GRAD missiles upon it. So destructive was the damage caused by the incessant bombardment, that a journalist for Time noted in an April 1992 article that "scarcely a single building [had] escaped damage in Stepanakert." The Azerbaijani military staged several ground attacks against the city, which were successfully repulsed by Armenian forces. It was not until 9 May 1992, with the capture of Shusha, that the ground bombardment ceased. The city, nevertheless, continued to suffer aerial bombardment for the remainder of the war. There has been an unofficial cease-fire observed since 1994. Stepanakert is located on Karabakh plateau at the centre of the de facto Republic of Artsakh (Nagorno Karabakh), at an average altitude of 813 m (2,667 ft) above sea level. The city has a humid subtropical climate (Cfa) according to the Köppen climate classification system and a semi-arid climate (BS) according to the Trewartha climate classification system. In the month of January, the average temperature drops to 0.5 °C (33 °F). In August, it averages around 22.6 °C (73 °F). During the period of USSR, Stepanakert has served as the capital of the Nagorno-Karabakh Autonomous Oblast within the Azerbaijani Soviet Socialist Republic, between 1923 and 1991. With the independence of Artsakh in 1991, Stepanakert continued with its status as the political and cultural centre of the newly-established republic, being home to all the national institutions: the Government House, the National Assembly, the Presidential Palace, the Constitutional Court, all ministries, judicial bodies and other government organizations. Artsakh is a presidential democracy since the 2017 constitutional referendum. The Prime Minister's post was abolished and the executive power is now residing with the President who is both the head of state and head of government. The president is directly elected for a maximum of two-consecutive five-year terms. The current President is Bako Sahakyan. On 19 July 2012, Sahakyan was re-elected for a second term. He was again re-elected to a third term on 19 July 2017. The National Assembly is a unicameral legislature. It has 33 members who are elected for five-year terms. During the Soviet era, there were no traditional churches in Stepanakert, although most of the population of the city were members of the Armenian Apostolic Church. The late-19th-century church of Saint George was destroyed in the 1930s to build the Stepanakert Drama Theatre. Currently, the church of Surp Hakob (or Saint James) opened in 2007 is the only church of the city. It was financed by benefactor Nerses Yepremian from Los Angeles. The church was consecrated on 9 May 2007, in honor of the 15th anniversary of the liberation of Shushi. The construction of the Holy Mother of God Cathedral was launched on 19 July 2006. The cost of the project is expected to be around US$2 million and the architect of the church is Gagik Yeranosyan. However, the construction process is slow due to the lack of financial resources. The inauguration of the church was expected to take place in September 2016, however as of 2018 the church is still under construction. There is a small community of Armenian Evangelicals with around 500 members. The Evangelical community supports many schools, hospitals and other institutions through the help of the Armenian Diaspora. The Vahram Papazyan Drama Theater of Stepanakert was founded in 1932. In 1967, the monumental complex of Stepanakert known as We Are Our Mountains was erected to the north of Stepanakert, It is widely regarded as a symbol of the Armenian heritage of the historic Artsakh. After the independence of Armenia, many cultural and youth centres were reopened. The cultural palace of the city is named after Charles Aznavour. Stepanakert is home to the Mesrop Mashtots Republican Library opened in 1924, Artsakh History Museum opened in 1939, Hovhannes Tumanyan Children's Library opened in 1947, Stepanakert National Gallery opened in 1982, and the Memorial Museum of the Martyred Liberators opened in 2002. A new cultural complex of the Armenian heritage of Artsakh is under construction. The Artsakh State Museum based in Stepanakert, has an important collection of ancient artifacts and Christian manuscripts. Stepanakert is served by a number of regular minibus lines. Old Soviet-era buses have been replaced with new modern buses. Regular trips to other provinces of Nagorno-Karabakh are also operated from the city. Stepanakert is served by the nearby Stepanakert Airport, north of the city near the village of Ivanyan. In 2009, facilities reconstruction and repair work began. Though originally scheduled to launch the first commercial flights on 9 May 2011, Karabakh officials postponed a new reopening date throughout the whole of 2011. In May 2012, the director of the NKR's Civil Aviation Administration, Tigran Gabrielyan, announced that the airport will begin operations in summer 2012. However, the airport still remains closed due to political reasons. The OSCE Minsk Group, which mediates the Nagorno-Karabakh conflict, reaffirmed that the operation of this airport could not be used to support any claim of a change in the status of Nagorno-Karabakh, and urged the sides to act in accordance with international law and consistent with current practice for flights over their territory. Stepanakert used to be connected through a railway line with the Yevlakh station on the Baku-Tbilisi railway. However, trips between Azerbaijan and NKR are abandoned since the start of the war between the two sides. Stepanakert is the centre of the economy of Artsakh. Prior to the Nagorno-Karabakh War, the economy of Stepanakert was mainly based on food-processing industries, silk weaving and winemaking. The economy was severely damaged during the war. However, in recent years, the economy has been developed mainly due to investments from the Armenian diaspora. The most developed sectors of Stepanakert and the rest of the Republic of Artsakh are tourism and services. Several hotels have been opened by diasporan Armenians from Russia, the United States and Australia. Artsakhbank is the largest banking services provider in Artsakh, while the Karabakh Telecom is the leading provider of mobile telecommunications and other communication services. Stepanakert is also home to many large industrial firms including Stepanakert Brandy Factory, Artsakh Berry food products and Artsakh Footwear Factory. Construction is also one of the leading sectors in the city. Artsakh Hek is the leading construction firm, while Base Metals is the leader in mining and production of building materials. Artsakh State University, founded in 1969 as a branch of the Baku Pedagogical Institute. In 1973, it was renamed Stepanakert Pedagogical Institute and following the independence of Nagorno-Karabakh, in 1992, it received its current status. The university offers courses spread across seven departments and has an attendance level of 4,500. Stepanakert campus of the Armenian National Agrarian University. Gyurjyan Institute for Applied Arts (private). Many new schools in Stepanakert were opened during the last decade with the help of the Armenian diaspora. Existing schools were also renovated with donations from the diaspora. The Stepanakert branch of Tumo Center for Creative Technologies was opened in September 2015, as a result of the continued cooperation between the Tumo center and the Armenian General Benevolent Union, with the support of mobile operator Karabakh Telecom. Football is the most popular sport in Nagorno-Karabakh and the city has a renovated football stadium. Since the mid-1990s, football teams from Karabakh started taking part in some domestic competitions in the Republic of Armenia. Lernayin Artsakh is the football club that represents the city of Stepanakert. The Artsakh national football league was launched in 2009. The non-FIFA affiliated Artsakh national football team was formed in 2012 and played their first competitive match against the unrecognized Abkhazia national football team in Sukhumi on 17 September 2012. The match ended with a 1–1 draw. The following month, on 21 October 2012, Artsakh played the return match at the Stepanakert Republican Stadium against Abkhazia winning it with a result of 3–0. There is also interest in other sports, including basketball and volleyball. Artsakh athletes also take part with the representing teams and athletes in the Pan-Armenian Games, organized in the Republic of Armenia. As an unrecognized entity, the athletes of Artsakh compete in international sports competitions under the flag of Armenia. 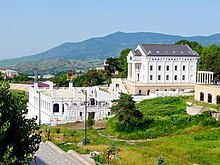 Montebello, United States: On 25 September 2005, Montebello, California and Stepanakert became sister cities. This prompted a complaint by the ambassador of Azerbaijan to the United States, Hafiz Pashayev, who sent a letter to California leaders, stating that the decision jeopardized peace talks between his country and Armenia. The letter was sent to then-California governor Arnold Schwarzenegger, who deferred the letter to Montebello mayor Bill Molinari since it concerned a local, not a state, issue. Molinari responded to Pashayev that the city would go ahead with its plans to inaugurate Stepanakert under the sister city program. Stepanakert's relationship with Montebello is aimed at revitalizing the capital's economic infrastructure and building cultural and educational ties, as well as developing trade and health care between the two cities. Azerbaijan has described this as a contradictory foreign policy of the United States that purportedly supports the NKR government and Armenian aggression against Azerbaijan. 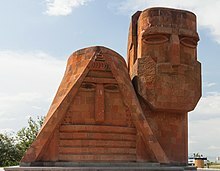 Yerevan, Armenia: Yerevan and Stepanakert, the capitals of the two Armenian republics, became sister cities after a partnership agreement signed on 28 September 2012 between the mayors of the two cities. San Sebastián, Spain: San Sebastián (Donostia) and Stepanakert signed a cooperation agreement on 15 September 2014. ^ "Tourism department of ministry of economy of NKR". ^ a b "Figures" (PDF). stat-nkr.am. 2015. ^ a b c d (in Armenian) Mkrtchyan, Shahen. «Ստեփանակերտ» [Stepanakert]. Armenian Soviet Encyclopedia. Yerevan: Armenian Academy of Sciences, 1985, vol. 11, pp. 124–125. ^ a b c Hewsen, Robert H. (2001). Armenia: A Historical Atlas. Chicago: University of Chicago Press. p. 265. ISBN 0-226-33228-4. ^ a b c "Dağlıq Qarabağ münaqişəsi: Tammətnli elektron materiallar məcmuəsi" (PDF) (in Azerbaijani). Azerbaijani Presidential Library. 2005. p. 123. Retrieved 5 June 2016. ^ a b Carney, James. "Carnage in Karabakh." Time. 13 April 1992. Retrieved 2 August 2007. ^ "Xankandi (Stepanakert) Climate Normals 1961–1990". National Oceanic and Atmospheric Administration. Retrieved 22 March 2015. ^ "The Office of the Nagorno Karabakh Republic in USA". Nkrusa.org. Retrieved 6 May 2012. ^ Grigorian, Laura (10 May 2007). "ST JAMES CHURCH WAS OPENED IN STEPANAKERT". Armenian News. Archived from the original on 4 April 2012. ^ "The church of Stepanakert". www.stepanakert-church.org. ^ Nicholas Holding, Armenia with Nagorno Karabagh, 2nd ed. (London: Bradt, 2006; ISBN 1-84162-163-3), p.210. ^ "Ստեփանակերտի մէջ նոր յուշահամալիր կը կառուցուի - Azat Or". 17 March 2017. ^ "Karabakh To Reopen Stepanakert Airport". Asbarez. 5 October 2010. Retrieved 11 October 2010. ^ "Nagorno-Karabakh Flights On Hold Despite Airport Reconstruction". RFE/RL. 16 May 2011. Retrieved 16 May 2011. ^ (in Armenian) "«Հայկական ժամանակ».Ստեփանակերտի օդանավակայանը վերջապես շահագործման կհանձնվի" [Haykakan Zhamanak: Stepanakert Airport will Finally Become Operational]. Yelaket Lratvakan. 30 May 2012. ^ Statement of the OSCE Minsk Group Co-Chairs. ^ Hayrumyan, Naira. "Recovery and Concern: Regional Unrest Reminds of NKR's Years of Progress While Raising Anxiety Archived 22 September 2010 at the Wayback Machine." AGBU Magazine. Vol. 18, № 2, November 2008, pp. 34–37. ^ (in Armenian) Anon. "ԱՐՑԱԽԻ ՊԵՏԱԿԱՆ ՀԱՄԱԼՍԱՐԱՆ (Arts'akhi Petakan Hamalsaran, Artsakh State University) Archived 27 September 2011 at the Wayback Machine." Azat Artsakh. 29 August 2006. Retrieved 4 September 2009. ^ "Armenia Fund Opens 600-Student School in Stepanakert." Asbarez. 14 September 2010. Retrieved 4 December 2010. ^ "Tumo Center Opens in Stepanakert". Asbarez. 1 September 2015. ^ "Stepanakert "Tumo" Center is planned to be launched in September". Armenpress. 13 August 2015. ^ (in Armenian) "Աբխազիայի ու Արցախի հավաքականները բաժանվեցին խաղաղությամբ՝ 1:1 [Abkhazia's and Artsakh's Teams Peacefully Part Ways, 1-1." Tert.am. 25 September 2012. Retrieved 7 November 2012. ^ "Armenia’s newly formed second national football team to face Abkhazia." News.am 14 September 2012. ^ "Asbarez.com Artsakh Soccer Team Beats Abkhazia 3-0." Asbarez. 22 October 2012. ^ a b Wright, Pam. "Montebello's newest Sister City program has come under fire from an ambassador for the Republic of Azerbaijan." Whittier Daily News. 19 November 2005. Retrieved 2 August 2007. ^ "Azeri pressure group appeals to US envoy over twinning reports." BBC News in BBC Monitoring Central Asia. 24 November 2005. Retrieved 2 August 2007. ^ LLC, Helix Consulting. "Stepanakert, Donostia sign cooperation agreement". www.panorama.am. Wikimedia Commons has media related to Stepanakert. Look up Stepanakert in Wiktionary, the free dictionary. 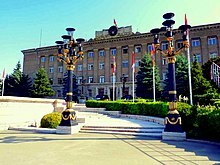 Wikivoyage has a travel guide for Stepanakert. This page was last edited on 26 March 2019, at 04:20 (UTC).